Sometimes life can feel a little out-of-control. Especially when it's late and you're working on starting-up or repairing a process application such as a sewage pumping station. Field service techs need to be able to control variables so that they can isolate and fix a problem. However, a sewage wet well is an active place. Stuff is constantly flowing-in and then being pumped-out. Understandably, the signal that's produced by the associated level sensor (e.g. submersible, ultrasonic, radar, etc.) is constantly changing. 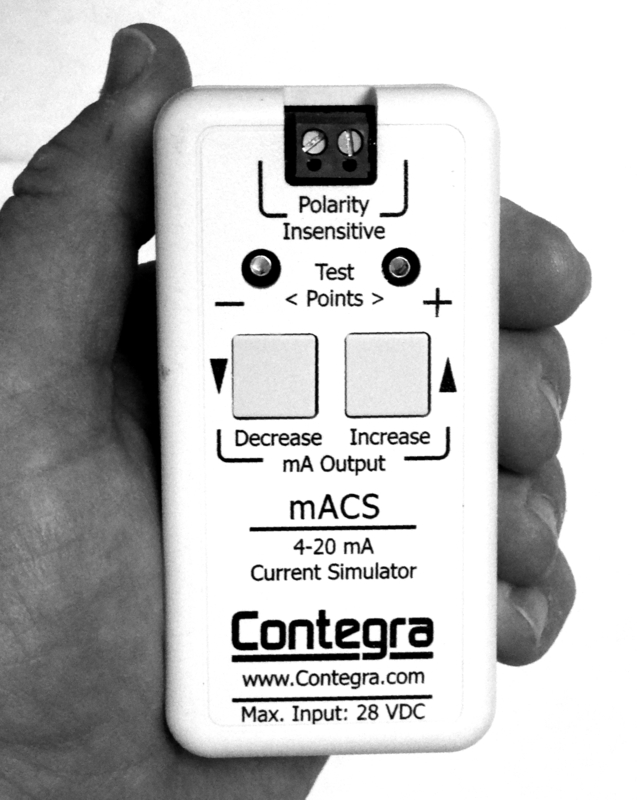 Contegra's mACS (pronounced Max) helps to restrict the variables by providing a stable & push-button adjustable 4-20 mADC output. The field service rep uses the mACS as a temporary substitute for the level-sensing device. The tech is then able to remove the variable signal and concentrate on the controller's adjustment and setup.